]All those with a weak stomach look away now! 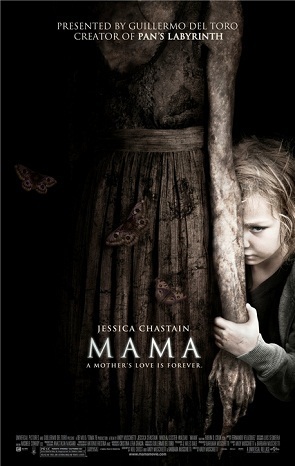 Just kidding, although Mama is not for the faint hearted. A new creation of of Guillermo del Toro, grand master of horror. Mama tells the story of two children Victoria and Lilly, whose mother is murdered and whose father goes mad, takes them into the woods and tries to shoot them but is killed in the process. Cut to five years on and the two girls are miraculously found by their uncle Lucas (brother of their deceased father). Lucas desperate to help the girls agrees to look after them with his rock band girlfriend Annabel. Neither Lucas, nor his partner have any idea what they are doing coping with two highly damaged children, yet a little bit of progress is made particularly by Annabel. and Isabelle Nelisee play the two sisters and both are brilliant, particularly because they are both so young. There are some truly disturbing scenes that make the audience weep and scream in turns. When the two girls are initially abandoned in the woods, there is a shot of then three year old Victoria, desperately holding onto her one year old baby sister Lilly ,as they sit by a diminishing fire. It is sweet and horribly tragic as there is a realisation by both Victoria in the story and the audience that they are completely alone.